Celebrity websites are buzzing about Cara Delevingne’s ring finger. The model-actress and girlfriend Annie Clark (the musician also known as St. Vincent) were seen wearing what appeared to be matching rings on their left hands. 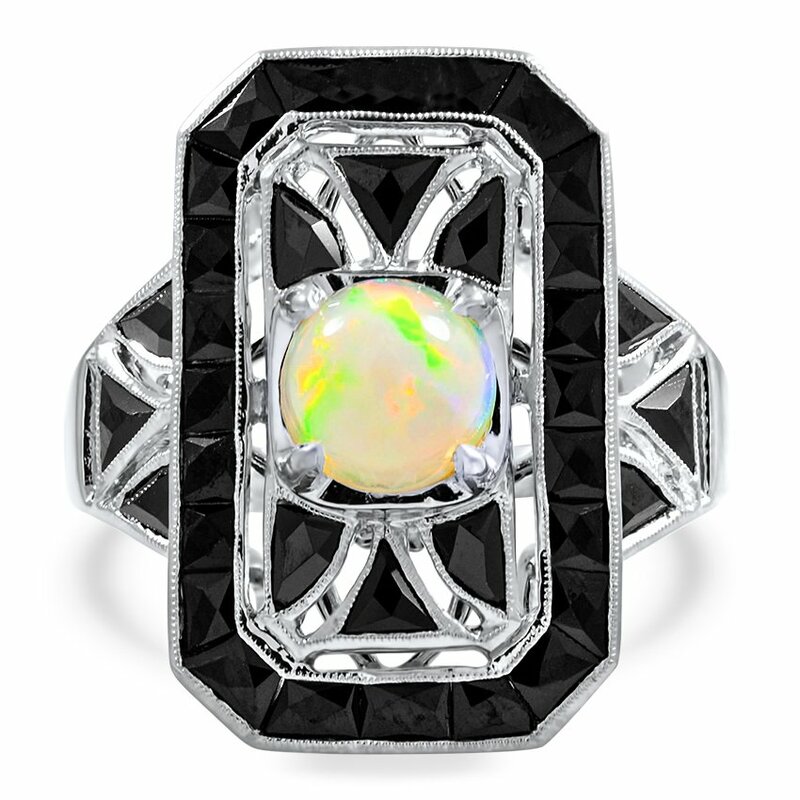 An incredible Art Deco reproduction piece, this fascinating 18K white gold ring features a natural opal surrounded by geometric shapes crafted from French cut onyx. 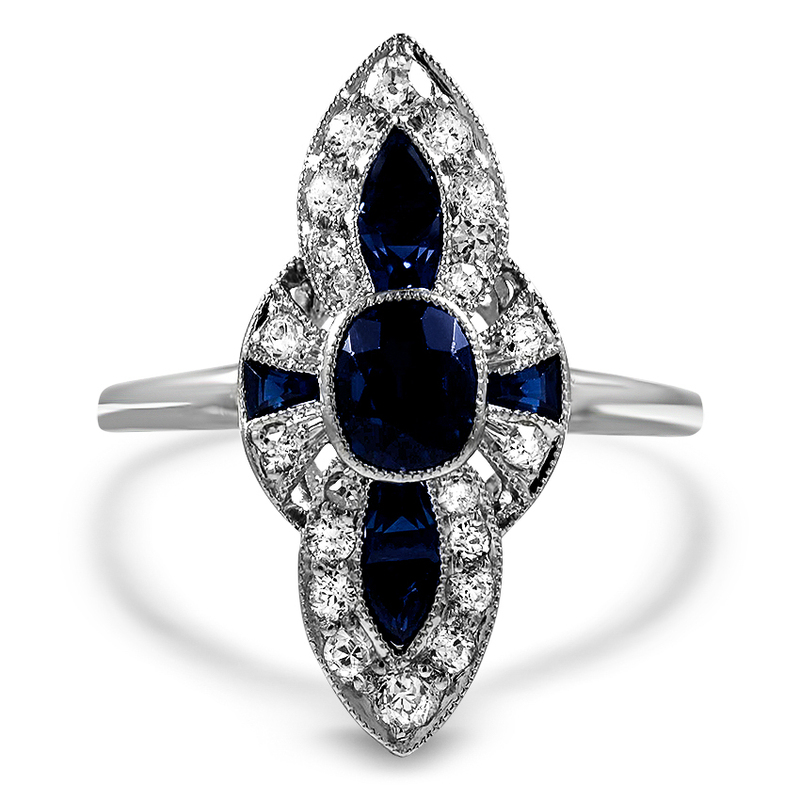 The Passion Ring flaunts a cushion-shaped sapphire set within a uniquely crafted halo of diamond and sapphire accents. 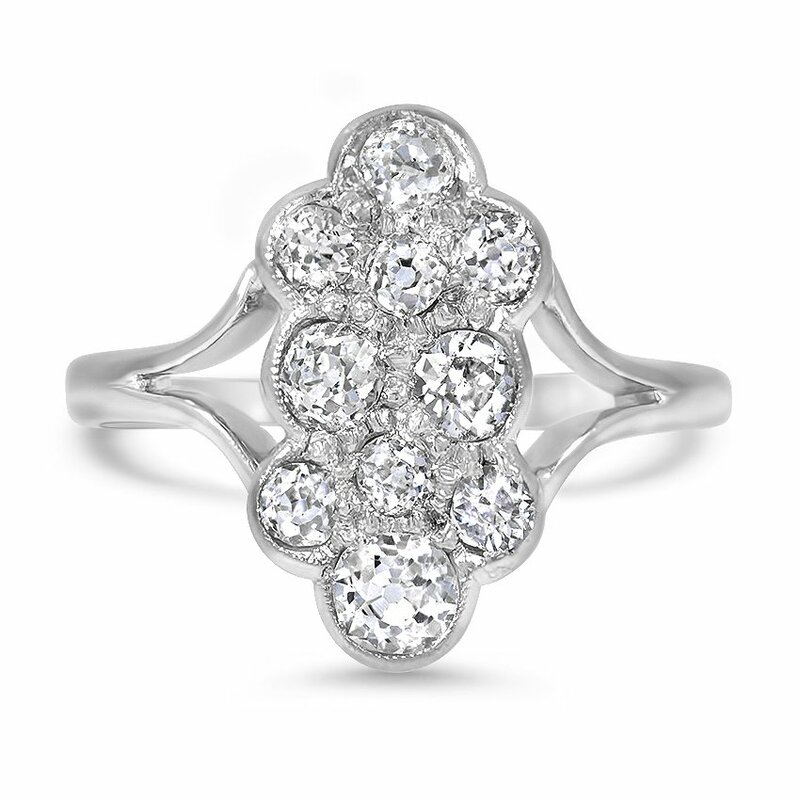 Rows of milgrain decorate the top while the pierced gallery adds elegance to this incredible ring. 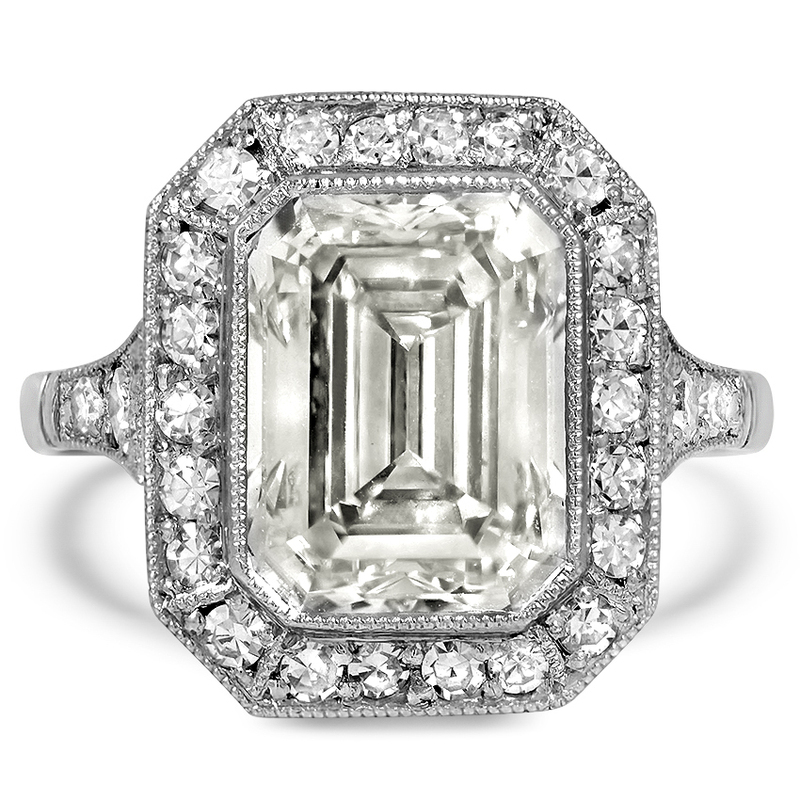 Feminine and utterly exquisite, this platinum Art Deco-era ring boasts a beautiful cushion-shaped old mine cut diamond encircled by a halo of eight old mine cut diamond accents, each held delicately upon its own milgrain encrusted petal. The ornate open gallery brings flair to this floral-inspired piece. 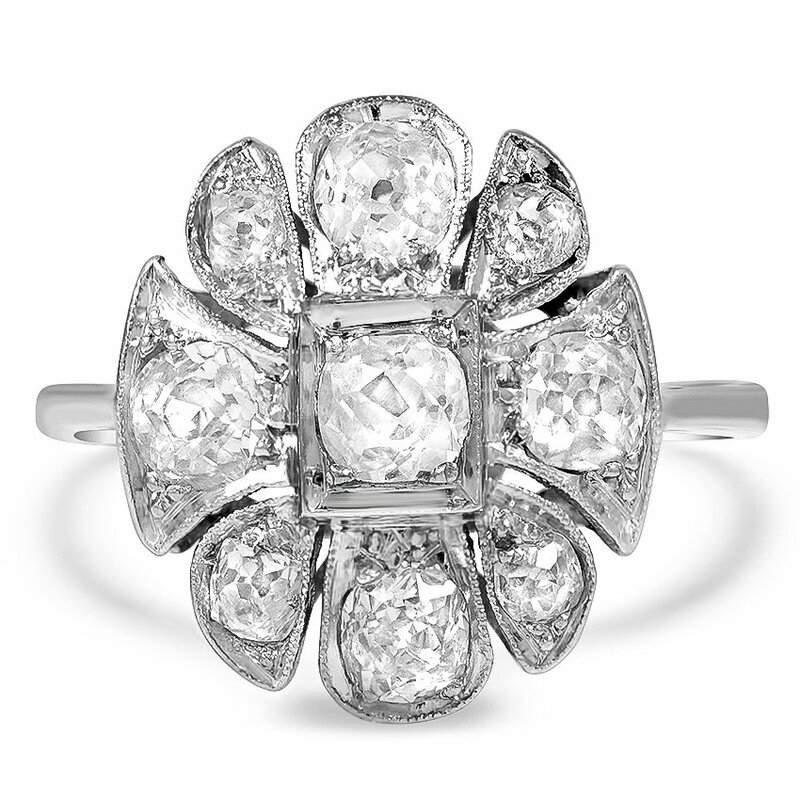 This gorgeous Art Deco-era ring boasts a cluster of ten lustrous old European and old mine cut diamonds surrounded by milgrain detail and bezel set within a 10K white gold setting. 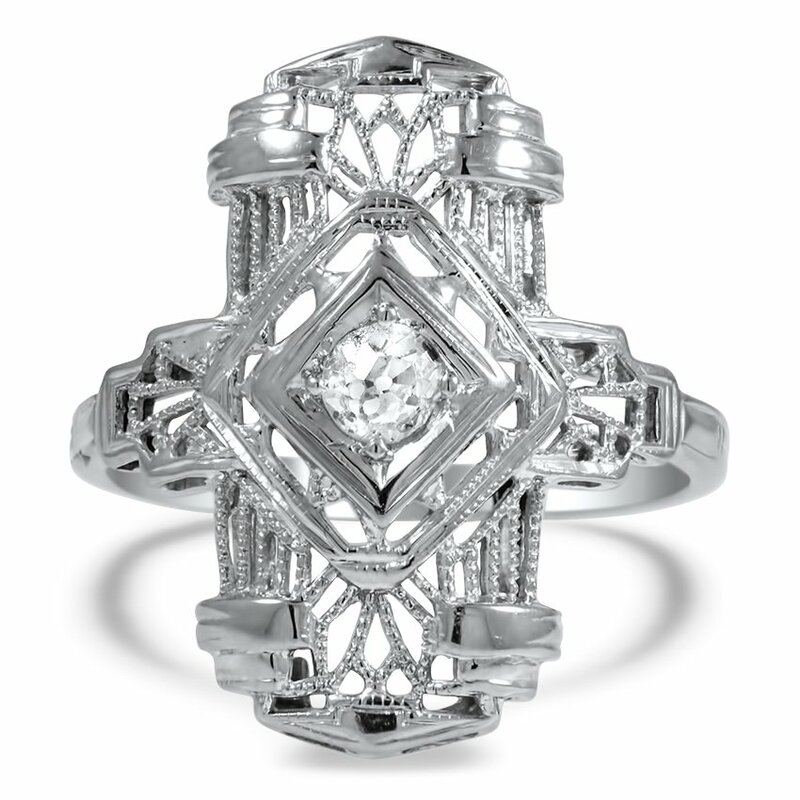 Alluring Art Deco-era details make this 18K white gold and old European cut Benassay Ring a rare vintage treasure. I didn’t know who Cara Delevigne was but thought she might be one of those rare celebrities that would give the cost of an engagement ring to starving children or some other deserving charity. Oh, well! Status symbols are certainly more important than starving children. This is an ad disguised as an article. Poorly. De toute beauté ce que vous faites. Reading through people bashing this model was pretty weird. She’s just a person, and so what if doesn’t look like how you want someone to look. People should really be ashamed of how judgmental they are to someone who hasn’t done anything to them or seemingly others, their worst crime being famous and in love. Those rings are beautiful…just stunning! Not my taste, but we all like what we like right? Good for them if they are in fact engaged. Who doesn’t love love? You all have really Bad Taste, That’s Gordy looking…looks cheap and looks FAKE. I know its not. Buts thats a real Ugly Awful Ring. @markel that is close minded, hurtful, and you should be ashamed that the thought crossed your mind. WOW ! How does a site promoting rings turn into a open ( and incredibly ignorant ) rant about the model involved. You’re opinions on the model have no relevance at all. Lol how is she even engaged? She’s so ugly and looks like she’s never taken a shower in her life. I’m shopping and its such a hard thing to do. We would be happy to add you to our email list. Thanks for your interest in Brilliant Earth! These are very nice rings, however, you chose to show one dirt ugly person wearing one. I would not want to be associated with someone (Delevingne) who obviously became famous because of her horrible looks and questionable orientation. If you have an email list, I would appreciate it if you would add my email address. Thank you so much. This girl looks batshit crazy. Sent her to me and she will forget she ever liked women. Could care less about the rings, honestly. Wearing too much make-up is more of a concern. Doesn’t make one look natural at all. Very distasteful. The natural looks so much better. But celebrities dont , NOT, wear make-up. A spectacular ring indeed. What would be the price estimation of yours concerning this masterpiece. It is phenomenal. Ruby Rose? Ugh. She reeks of desperation. Delevingne, on the other hand, just plain reeks. She’s infamous for being hygienically challenged. Could someone please steer Annie Clark to Ruby Rose, rather than this taylor Swift lap dog? Your article says you certainly can’t speculate if Cara is engaged and yet the title of your article refers to her (rumored) engagement ring and the link that got me here suggested I click to see Cara’s engagement ring (not rumored). Really?